Black watches for men are versatile and timeless. Sure gold might be a show stopper, and leather looks expensive, but are you showing off or being a real man? Your watch is your secret ingredient to a more organized, better-managed life. We’ve put together a list of the best black watches for men. Why Do I Need A Black Watch? How Do I Choose The Right Watch? Black watches for men are professional and classy. When you don’t want to upstage your presentation or entrance, a black watch fades into the background while remaining put together. Black watches for men are something every man should invest in, much like a woman’s little black dress. The best black watches for men go from the office to drinks without looking too fussy. You won’t have to worry about someone tailing you all night to steal it, but you know you can rely on it to keep working. It goes with everything without taking attention away from what matters, you. Let’s take a look at a few things to consider. Black watches for men have a few different types of movements. Watch movements come in three categories. 1. Mechanical movements are powered by a spring and wound by hand. The longer your mainspring, the longer you can go between winding. If you choose this type, pay close attention. Not all craftsmanship is created equal. They’re convenient because they never require a battery, but they aren’t quite as accurate. 2. Automatic watches are just like mechanical, but the natural movements of the wearer throughout the day wind the watch. They’re a little easier than manual winders, but you have to wear your watch every day to keep it current. 3. Quartz watches use electricity from a small battery. Electricity moves through a quartz crystal causing it to vibrate. Those vibrations convert to a pulse which drives the hands. These are affordable and extremely accurate. If you want something fancy, quartz probably isn’t it. However, they make up for it in reliability. Black watches for men also come in a few different styles. Here are some of the most common types of black watches for men. 1. Dress watches are an extension of the original pocket watch. They’re sleek and are rarely flashy. Typically, they’re on the thinner side, so they don’t interfere with a button down shirt cuff. The face is simple with few features aside from telling the time. 2. Field Watches are modeled after WWII trench watches. They’re intended to be a bit more rugged than their dress counterparts, but they have some similar features. They’re slim and stylish, but a little more casual with a military feel. 3. A Dive Watch is water resistant and rugged. It has a hermetically sealed case to prevent water damage. They’re typically made of stainless steel or titanium instead of leather, although you can find some made of silicon. The band is usually longer than the standard watch band so that it could fit around dive equipment. 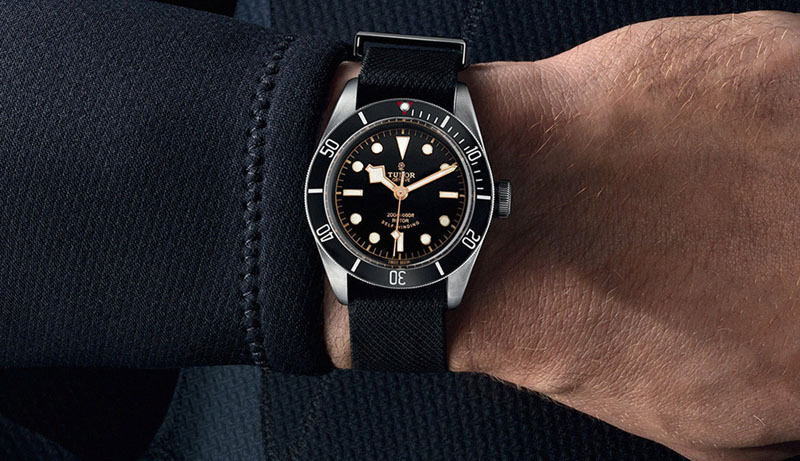 James Bond made diver watches famous, and they haven’t gone out of style since. 4. Aviator watches have a chronograph on the face and are medium to large. They usually have large numbers so they could be read in a dark plane. They’re larger than average but don’t conform to a particular style. Aside from that, the look is mostly casual. The best black watches for men actually give you a lot of choices here. 1. Leather bands are usually dress-style and are appropriate for formal or casual wear. Titanium or stainless steel links are business-like and give you a bit of flash underneath your suit jacket. 2. Canvas straps are highly durable and won’t get ruined with a little water. They’re great for days when you dress down or don’t need such a formal, delicate watch. 3. Sports bands are another casual style. These are silicon, rubber, or nylon and are meant for serious outdoor activities where your watch will encounter water, dirt, and a lot of abuse. Some watch faces have comfortable bands to change out. These might be a good choice if you spend a fair amount of time doing a lot of different activities but really enjoy the watch face you have. The big one. Are the best black watches for men expensive? The short answer is no, but it’s a little more complicated than that. Mass produced luxury watches do have a lot of cool features. Some of the big watch brands are expensive not because they’re scarce but because they have good marketing. You can get good watches for less than $50, but some of the materials and parts might not be as luxurious as TAG Heuer, but they’ll definitely get the job done. Genuinely scarce watches can run you in the tens of thousands of dollars if not more. They’re often made by hand and take anywhere from a few months to a year to put together. Are they better than your supermarket watch? Maybe. They’re definitely pieces for bragging rights, and they’ll be something you hand down to your son one day. Are they better timepieces overall? It depends on your needs. The best black watches for men fit your budget and fit what you need. Even digital watches have a place (though they aren’t nearly as pretty) and it’s important that the watch does what you need it to do instead of paying for busy bells and whistles you never look at. And now our list. These are our picks for best black watches for men. We’ve chosen a variety of styles and prices so you can find the perfect one. Let’s take a look. Black watches for men are versatile. Fossil’s watch is a heavy duty, all black metal watch intended to go with your t-shirt and your suit. It’s a quartz movement watch with a simple line style face. The case size is 42mm, which is on the larger side of standard sizes. It should fit most wrist sizes and be a nice larger watch face for the average wrist. The dial is textured for easier settings. Black stainless steel is durable subtle. It’s water resistant but not waterproof. You can’t dive with it, but you could wear it in the shower or to the pool without damage. The hands and number lines glow slightly, but if you’re looking for something that you can really see in the dark, this might not be the right choice. Also, you have to keep adjusting the date since there’s no month indicator. Black watches for men can be statements too. Here, Casio is reliable and durable, and the gold accents are pretty out there. However, if you’re looking for a watch for your collection, this one has some versatility. It has a black resin band that resembles metal links. It’s shock resistant and water resistant down to 200 meters. There’s a back light so you can see it in the dark. It has four different alarms and time zones, a snooze button, a full calendar, and a digital readout in 12-hour and 24-hour time options, which is a standard feature of black watches for men. A lot is going on with this one. It might be a good idea if you’re heading outdoors but don’t want a sports watch that looks like everyone else’s. One downside is the hour and minute hands can blend into the face because of everything that’s going on. This Nixon model is an extra-large example of black watches for men. The casing is 48mm across, so if your wrist is larger than average, this one might be a good choice. It’s durable and water resistant down to 100 meters. The band is brushed stainless steel but black so you won’t see scratches or wear as soon as you would with standard metal bands. The face displays the four cardinal numbers with lines for others. You can have a jeweler adjust the band for you if your wrist is smaller. The links can sometimes give out if you aren’t careful, but overall, it’s a durable, simple option for a sports watch. There’s no calendar function, and the dials are supposed to be luminous (they aren’t very bright). If you’re looking for something completely different, Aposon’s unique example of black watches for men isn’t your standard watch face. It has two dials, one with a conventional analog time and the other with a rotary time. It’s a quartz movement, and the casing is stainless steel. It comes with a black leather band. You have the option of setting it to two different time zones so it might be good if you travel often. It isn’t water resistant, so you’ll need to take it off even for the shower. It’s an affordable option for someone who wants something a little different. There aren’t any other features aside from the dual timepiece, but overall, it’s a good option for a black watches for men collection. This Fossil model includes a Chronograph. If you want an aviator style black watch for men, it’s an affordable option. The case size is slightly larger at 45mm, but the watch face is easy to read with contrasting number and hands. The band is brushed stainless steel, which won’t show as much wear. The casing border is textured as well as the dial. It’s water resistant. The face also shows today’s date between the four and five mark. It’s very durable, but the links are a bit larger. It might be difficult to get the size of strap you really need because you don’t have much leeway with the links. This model is a dress style watch with a simple face design and chrome accents. The band is a textured polyester, making it more comfortable than some other band styles, but you won’t have to worry about wear to a leather band. It’s 44mm across the casing, so it’s suitable for standard sized wrists. You can take it in the shower and swimming because it’s water resistant up to 100 meters. There’s a small date window at the three mark. The Eco-Drive line uses solar power to drive the watch movement (no batteries). The hands are slightly luminous after light exposure, but it doesn’t have a full backlight. It’s got a low profile, so it should fit just fine under your dress shirt or suit jacket. Sometimes you don’t want to bother with an analog face on black watches for men. You have more important things to do like Ironman triathlons, or working the circuit at the gym. Timex is an ultra-budget, digital watch with simple to read face. It shows you time, day, and date with a simple gray scale face. It has a 30 lap memory and an Indiglo backlight. You can split times with a simple button on the front. It has a resin strap with buckle closure and is water resistant up to 100 meters. There’s a 24-hour countdown timer and three different alarm options. You can also set it with up to three time zones. The materials are ultra light, so there’s nothing to weigh on your wrist as you train or complete your outdoor hobbies. It’s not the most stylish of the bunch, but it’s durable and useful. Vincero’s luxury model of black watches for men is an affordable but sleek design that fits well under dress shirts and suits. It has a 43mm watch casing for a slightly smaller fit. The watch casing is surgical grade stainless steel, so there are fewer scratches and overall wear and tear. The face is sapphire coated for better durability as well. It has a precise Japanese quartz movement and three different chronograph readings. The watch band is black leather cut from genuine calfskin. It ages well and is very comfortable. There’s a small date readout on the bottom of the watch face. The case back has a piece of Italian marble. It’s not visible when it’s worn, but it is a beautiful little detail for you. The watch comes from small batch factories, and because Vincero sells direct to consumer, you get a slightly more luxe watch for a very affordable price. The best black watches for men don’t have to be expensive. By Invicta’s watch is a sporty aviator style with stainless accents. It has three chronograph functions and a date marker close to the bottom of the watch face. The numbers are roman numeral style with contrasting hands. It’s waterproof up to about 50 meters so you can do some light swimming, but don’t go crazy in the water. The band is textured leather with simple buckle closure. The hands are slightly luminous, but you might not see them super clearly in the pitch black. It’s durable but doesn’t stand out if you decide to wear it to the office. We think this might be a good choice of black watches for men who need a watch that can transition from weekends to the office without causing a lot of fuss. Another example of diver style black watches for men. Casio’s analog model is a simple black face with high contrast numbers and a stainless steel casing. The band is a durable resin style so you won’t have to worry about stains or water, but it’s not as heavy as metal bands. It’s water resistant up to 200 meters, so you really never have to worry about water damage. The screw down lock and back helps keep the inner pieces free of water and dust while being easy to access if you need to get back there. It has a small date display at the three o’clock position. It uses atomic time settings, so it’s very accurate. Overall, it’s an excellent all-purpose watch that keeps time like a more expensive model, but you don’t have to worry about beating it up. We love Fossil’s classic dress watch. The best black watches for men are durable, useful, and stylish. This model’s stainless steel is durable, but the brushed black finish doesn’t show wear and tear. Plus, it’s a more subdued version of bright stainless, so it looks great with a variety of outfits day to evening to weekend. It’s affordable, but the quality should last you a long time before thinking about replacing it. If you’re investing in a new, all-purpose watch, this one might check off everything on your list. Is this new watch going to be part of a collection or your go-to watch of choice? Let us know in the comments below.